Understanding how your utility is charging you for electricity and how to maximize your electricity consumption in order to maximize your yield is essential for your business. Despite knowing for years that electricity is a major expense that can significantly affect everyone’s bottom line, marijuana businesses – especially growers – are still struggling to keep costs manageable. Conducting in-depth case studies to better understand energy-consumption issues. Assigning employees to work exclusively with marijuana businesses. Recommending lighting as well as heating, ventilation and air-conditioning (HVAC) systems, which they say can save cultivators tens of thousands of dollars annually. Electricity consumption typically is the second-largest cost incurred by indoor cultivation facilities. That said, marijuana business executives can benefit from working with utility operators – provided an MJ exec is willing to as well. “In May of 2017, I started devoting 100% of my time to the cannabis operations coming into our territory, knowing that all those companies were going to fill one portfolio of commercial account management,” said Matt McGregor, strategic account manager, cannabis operations, for the Sacramento Municipal Utility District (SMUD). McGregor estimates he has roughly 200 marijuana customers, mostly growers, but also about two dozen customers involved in extraction, infusion, processing and packaging. 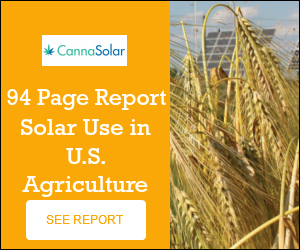 While more cultivators are accepting or seeking help from utilities, many remain leery. Not all energy companies are willing to help. Their cooperation depends in large part on whether they are dependent on one of the nation’s four federal power administrations which serve most of the United States, or one of the nation’s federally owned companies such as the Tennessee Valley Authority. Utilities that receive their power from these federal entities generally balk at providing cannabis businesses because they fear federal interference. Private utilities are less prone to those fears. Consider Puget Sound Energy (PSE), an investor-owned utility in Washington state, which has helped about 80 cannabis customers with about 100 energy-savings projects since 2014. PSE doesn’t get power or conservation funds from the region’s federal power company, the Bonneville Power Administration. Rather, PSE buys the power it sells to customers off the market or from its own power generation. “So, we didn’t have to be concerned about losing federal funding by serving the cannabis sector,” said David Montgomery, an energy management engineer with PSE. Xcel Energy – a private utility operator serving eight Western and Midwestern states including Colorado – goes by the same premise. “We work with marijuana companies because they are legal operating entities in the state of Colorado,” Xcel spokesman Mark Stutz said. It’s also in the interest of utilities to help growers cut their costs. As more customers demand more energy, utility companies may have to build new power plants to supply customers’ demands, which is costly. It’s cheaper to persuade existing customers to reduce energy usage by using conservation practices and buying newer, more efficient lighting and HVAC. “It was difficult in the first several years of legalization from an operational distribution standpoint to meet the needs of some of the growers,” Xcel’s Stutz observed. The utility had historically set up electric distribution systems in warehouse areas that were meant to meet certain loads. Later, these districts became home to cannabis cultivators, and the energy consumption increased dramatically, he explained. “This meant that we often had to upgrade distribution to meet the higher, 24-hour demand for use,” Stutz said. Now, utilities are looking to the cannabis industry as a place where they can help customers take pressure off the grid. “With the legalization of the cannabis market in Massachusetts, and the fact that this business is extremely energy-intensive, this is an agricultural area where there is opportunity to proactively influence the design of these facilities in order to mitigate their very significant energy demand,” noted Robert Kievra, a spokesman for National Grid, a major utility in Massachusetts. About 70% of the cannabis facilities in National Grid’s service area participate their rebate and incentive programs, Kievra added. Energy companies say the best way for marijuana growers to reduce their energy consumption is to switch from conventional lights to LED, and to upgrade HVAC. But many growers remain skeptical of LED lights, something that McGregor blames on a lack of education. “Trying out LED technology from two years ago is like trying out a 10-year-old laptop,” McGregor said. Because cultivators also have a lot to gain from marijuana-related energy rebates and incentives, lighting companies are often the ones connecting utilities with growers. “The folks who are really out there pushing LEDs, and saying PSE has money available, are the lighting companies and their reps,” PSE’s Montgomery noted. “They’ll bring us growers with whom we can do projects with,” added Montgomery, noting that his company works with about six lighting firms that provide customers with LED technology. Montgomery estimated he saves his marijuana customers about 50 million kilowatt hours per year. A kilowatt hour is a unit measuring the amount of watts used over 60 minutes. For example, 1,000 watts of power used for one hour represent one kilowatt hour. Despite outreach from PSE and lighting companies, cannabis businesses may have not taken much advantage of incentive programs. For example, Montgomery reckoned that LED lights should be installed at about one light per a 4-foot-by-4-foot area of canopy. That means 10,000 square feet of canopy would require about 625 lights, with each light costing about $1,000 each. “Even if we can pay a big part of it, they’re still on the hook for their portion of the project costs,” he observed.